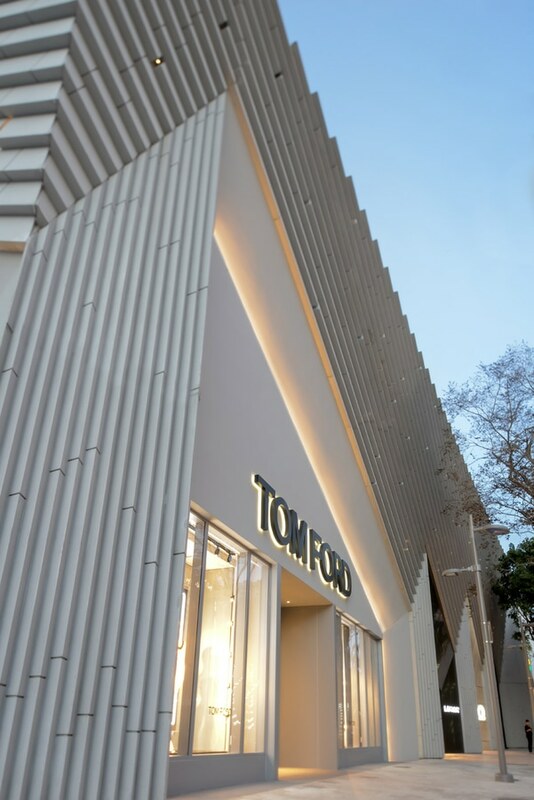 US firm Aranda\Lasch has completed a store for fashion designer Tom Ford in the Miami Design District, featuring an angular facade that references bold Art Deco motifs. 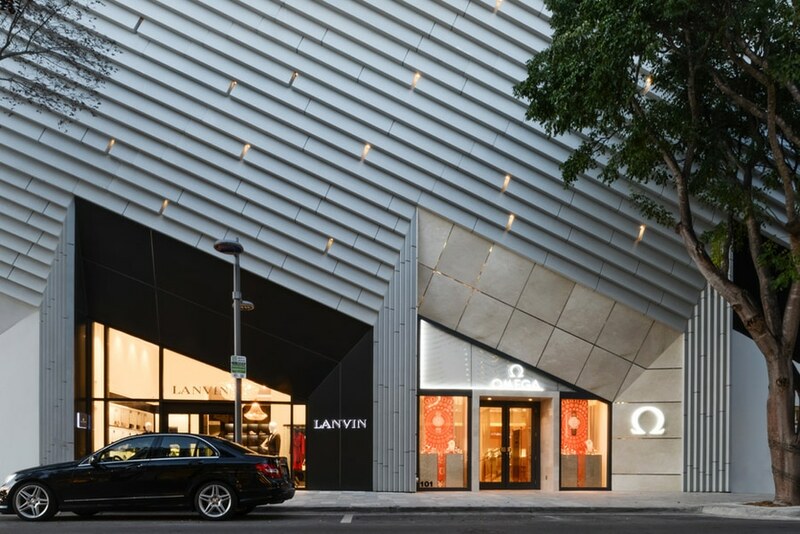 Situated on the corner of a busy Miami street, the shop is part of a new building by Aranda\Lasch that houses four luxury retailers, including French fashion brand Lanvin and Swiss luxury watchmaker Omega. The architecture studio – which recently designed looping Railing chairs made of metal pipes for Design Miami – referenced patterns and shapes typical on the Art Deco-period architecture around Miami in its design for building's facade. 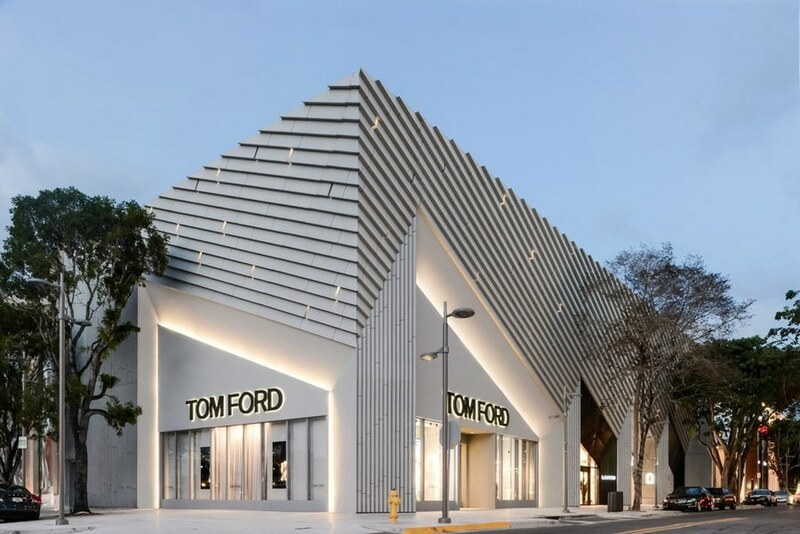 "Inspired by the pleated Art Deco patterns found in architecture and fashion, the facade is given a texture that revives the exuberance and ornament of Miami’s golden era," the studio told Dezeen. Glass fibre-reinforced concrete (GFRC) panels were moulded into a geometric formation. 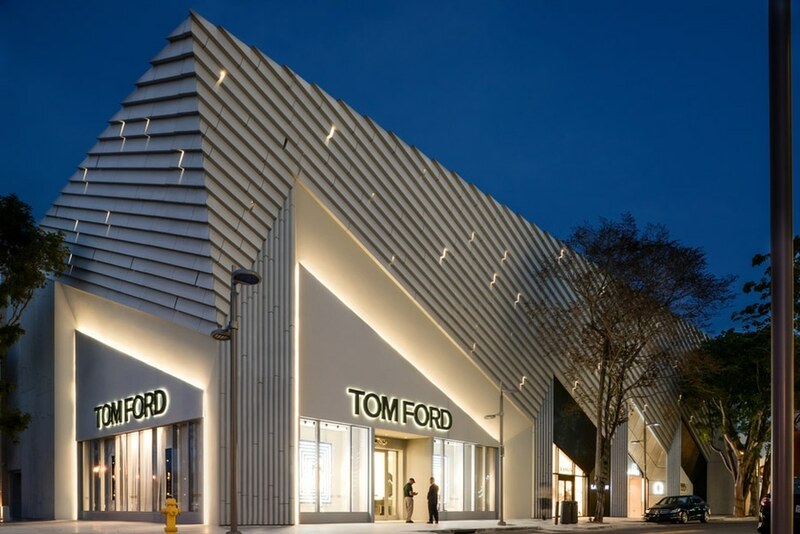 They were then applied to the facade, creating a serrated finish that contrasts with the smooth, angled sections around the entrance to the store and shop windows. At night, lighting integrated into the panel joints illuminates and emphasises the pattern. 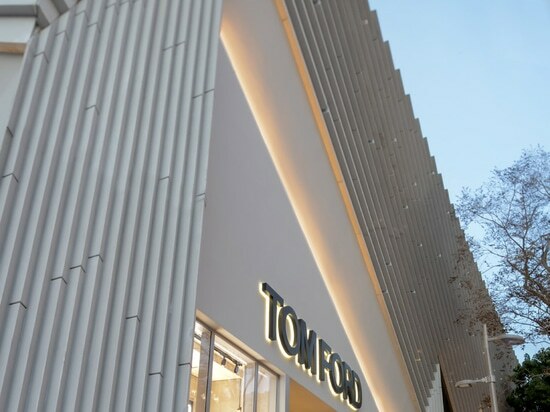 Inside the Tom Ford store, menswear and womenswear are split up over the two floors. Womenswear is located on the ground floor, where black marble tables are used to display perfume, eyewear and accessories. Ready-to-wear garments hang from Macassar ebony and chrome displays. A staircase leads upstairs to the menswear floor, which is split into five sections: accessories, fragrance and eyewear, sportswear, shoes and suiting. Tom Ford launched his own menswear brand in 2006 after leaving his post of creative director at Gucci. The American designer opened his first store on New York's Madison Avenue in 2007, before debuting his womenswear collection in 2010. 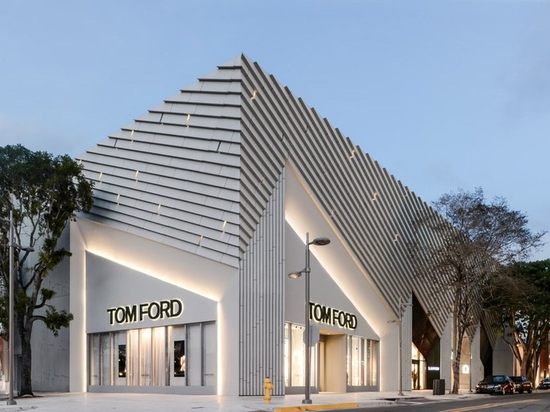 The Aranda\Lasch-designed building – titled the Art Deco Project – is part of Craig Robins' Miami Design District Development. 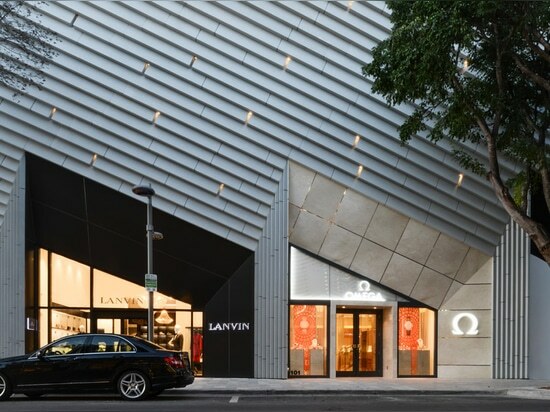 Robins, co-founder of the Design Miami fair, is turning the area into a neighbourhood dedicated to fashion, design, architecture and dining spaces. "Fashion is a powerful industry and when you combine it with the other businesses we have, it fuels the ability to do more art and design," Robins told Dezeen in an interview featured in our latest book. 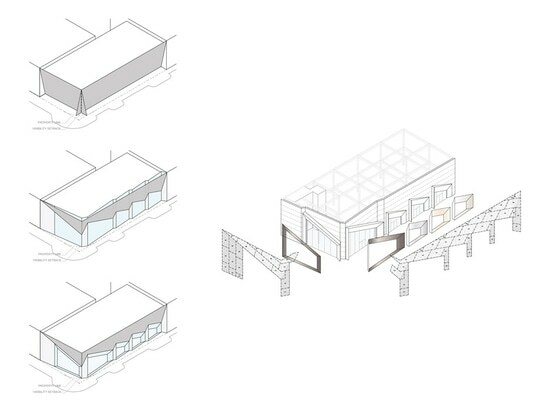 "Artists like John Baldessari and Nate Lowman are doing buildings. We commissioned a prototype from Konstantin Grcic. We’re doing buildings with architects like Aranda\Lasch, Sou Fujimoto, Keenen Riley." Nearby, Japanese architect Sou Fujimoto designed a shopping centre with long thin sections of blue glass attached to the facade – intended to look like rain. A domed structure conceived by architect Buckminster Fuller was installed in the middle.